The shortlist for the 2016 ALPSP Awards for Innovation in Publishing, sponsored by MPS Limited, has been announced. In a series of posts leading up to the Awards ceremony at the conference in September, we will focus on each project. Don't forget the shortlist will present in lightning sessions at the ALPSP Conference. Haven't got your ticket yet? Book here. First up is Dr Frances Pinter, Founder of Knowledge Unlatched. Knowledge Unlatched (KU) grew out of a conundrum. How could the decreasing print runs and increase of prices of monographs be good for scholarly communications? The digital sales were simply replacing the print sales to an ever decreasing number of institutions and did little to expand readership. So, what was to be done? We found a way to effectively ‘crowd-source’ the funding of the fixed costs of producing a book (getting to first digital copy costs) from a global network of libraries in exchange for putting the books online free to everyone in the world - Open Access on a Creative Commons license. Publishers continue to sell the books in other formats. What is the project you submitted for the Awards? There was no single project submitted for the awards. We focused on the fact that we are now scaling – able to offer hundreds of books per annum rather than just tens of books. We’ve also set up a backlist programme to complement the frontlist offers. Another piece of big news was the introduction of KU Research, a new arm that we established to conduct research into usage and impact of OA books. KU Research is a good place to brainstorm through some of the variations on the basic KU model before we introduce them into the market. We’ve set our own research agenda, already won a competitive award from the EU, are carrying out commissioned research for others and collaborate with other initiatives around the world. Tell us more about how it works and the team behind it. 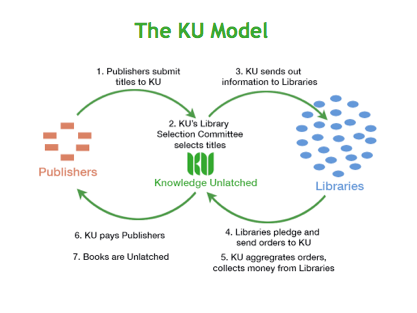 The core business of KU is to ‘unlatch’ books and soon journals, i.e. make it possible for high quality, peer reviewed, scholarly works to reach everyone with an interest in that particular work. The main model can best be shown by the diagram below. We ask librarians to guide us all the way; they are in control as the funding comes primarily from their budgets. The team is global. Three continental nationalities are represented out of our Berlin office where operations, sales and marketing occur and two Brits in the UK (though I am originally American). KU Research is run out of Perth, Australia where we also have a Turkish researcher. We now have a small base with a research fellow inside the University of Michigan Library. Representation on a number of boards and committees is also global. Publishers have always relied on selling one unit at a time. Whether it is a book or a journal subscription to a library or an individual, or now an APC for an article based service. The concept of crowd-sourcing for a product is new – with the KU model having potentially a profound impact on the cash flow for publishers. KU changes where payments are made in the value chain and does so by having created a unique balance of interests between publishers and librarians. Publishers get money in earlier while the cost of the product to participating libraries is less than an equivalent closed publication. In 2018 we will be presenting our first suite of journals for unlatching. The model has to be tweaked slightly in order to ensure sustainability, but it is not dissimilar to the books model. We are also working on projects that will have multiple sources of funding. In 2018 we will launch a book series that will have funding support from three sources - the learned society that originated the project, specialist research institutes that are active in that field and a wider group of libraries. KU’s job will be to coordinate this. We’ll also be focusing on expanding the work of KU Research. 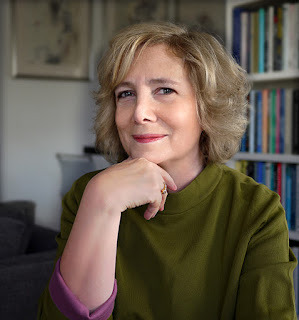 Dr Frances Pinter is the Founder and Ambassador for Knowledge Unlatched. She is a serial entrepreneur who has been at the forefront of innovation in the publishing industry for nearly forty years. She is passionate about books, and about the potential of new technology to increase access to knowledge. The winner of the ALPSP Awards for Innovation in Publishing, sponsored by MPS Limited, will be announced at the ALPSP Conference, Park Inn Heathrow London. Book you ticket now.